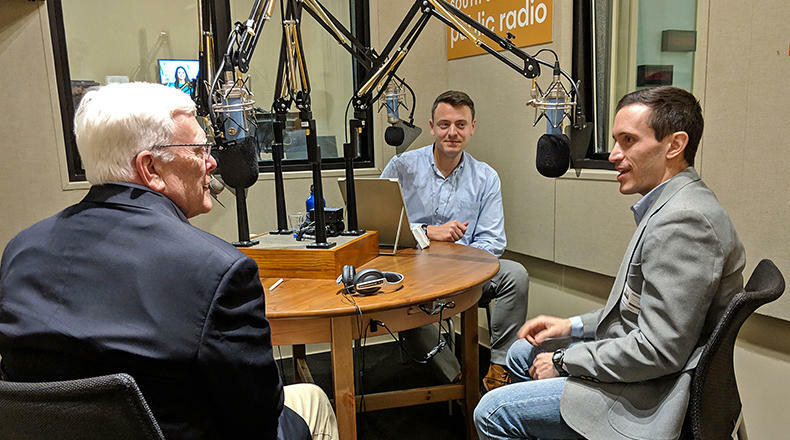 Gavin Jackson speaks with Russ McKinney (l) and Andy Brown (r) in the South Carolina Public Radio studios on Monday, February 11, 2019. On this episode of South Carolina Lede, host Gavin Jackson is joined by Post and Courier Statehouse Reporter Andy Brown and South Carolina Public Radio's own Statehouse Reporter Russ McKinney to discuss the past and potential future of Santee Cooper, the state-owned utility which partnered with SCE&G on the failed $9 billion V.C. Summer nuclear project. Russ McKinney then sticks around to quiz Gavin with South Carolina trivia in this week's Did You Know segment.